South Korea will provide financial assistance for cash-strapped auto parts makers to help them tide over the liquidity squeeze amid auto industry slump, the government said Tuesday. The Ministry of Trade, Industry and Energy announced plans to provide 3.5 trillion ($3.1 billion) worth of funding and loan guarantee for local auto parts makers, which have been grappling with shrinking sales at home and abroad. South Korea's auto industry is going through a hard time after GM Korea shut down its underutilized Gunsan plant in May, and Hyundai Motor and Kia Motors have posted disappointing earnings this year. To maintain the local supply chain, the government has already provided 1 trillion won worth of credit guarantee for small- and medium-sized auto parts makers and offered 1 trillion won of guarantee for them under the new plan. 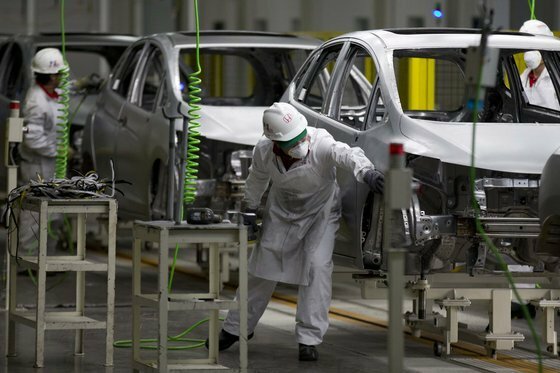 State-run financial institutions will extend their loan deadline by another year for contractors of GM Korea and auto companies in the southwestern city of Gunsan, which was designated as "an industrial crisis zone" following the American automaker's plant shutdown. In addition to the financial package, the government plans to boost domestic demand by extending a consumption tax cut for new vehicle purchases. The government will apply a 30 percent consumption tax break on new cars by June and a 70 percent reduction for those who replace diesel cars aged over 10 years with new gasoline vehicles next year. The number of diesel vehicles aged over 10 years, often blamed for greenhouse gas emissions, reached 3.34 million in the first half of this year, according to the ministry. The ministry also vowed to expand subsidies to eco-friendly cars, setting a goal of putting 430,000 electric cars and 65,000 hydrogen-fueled cars on the road by 2022.